Johnson & Johnson may be a dividend aristocrat and blue-chip bellwether, but these three catalysts would suggest that its share price has nowhere to go but down. Bet against healthcare conglomerate Johnson & Johnson (NYSE:JNJ) and you're liable to get hurt. Sure, it sounds like a line right out of The Sopranos, but it's the truth if you've dared to short-sell Johnson & Johnson's stock over the past four decades for any meaningful length of time. As we examined last week, there are a conflagration of factors which could see Johnson and Johnson's stock head even higher, despite its already large $280 billion-plus market value. These include the incredible success the company's pharmaceutical division has had with new drug launches, a bevy of shareholder incentives (including 52 consecutive years of dividend increases ), and what's expected to be the long-term boost in business from the Affordable Care Act, which is best known as Obamacare. But, even a giant like Johnson & Johnson has headwinds to overcome which could stymie its growth and push its share price lower. Today, we'll look at three such potential downside catalysts. However, before we do, I believe it's worth reminding everyone that the stock market and individual stocks do what they do because of the collective opinions and trades of millions of people. In other words, just because you're reading a bearish thesis on Johnson & Johnson here today doesn't guarantee that J&J's stock will head lower. That's something to keep in the back of your mind as you read further. Just as the Affordable Care Act is expected to result in more people being insured, and thusly more people visiting their doctor for preventative care testing over the long run, it's also the source of major headaches for medical device makers and most health care companies in general in the early going. Obamacare brings with it the promise of more comprehensive coverage for consumers, but it also comes with greater costs for a number of companies. Medical device makers, for example, are required to pay 2.3% of their top-line revenue per the medical device excise tax in the ACA. This tax is being used in conjunction with other collected revenue and fees to help pay for the expansion of Medicaid in the 26 U.S. states which have elected to expand their program. As Johnson & Johnson's medical device and diagnostics (MD&D) division is the largest in the world, with $28.5 billion in sales last year, this leaves the company very much exposed to this new tax. Also, additional uncertainties surrounding Obamacare, such as insurance premium inflation on the consumer end, and medical-care utilization (i.e., how often people actually go to the doctor) rates for hospitals and insurers, remain very much unanswered at this point. What this has done is pressured hospitals, insurers, and consumers to hold back on buying high-priced items and elective procedures until the "dust settles" and the answers to the aforementioned questions are clearer. For Johnson & Johnson that could mean weak U.S. MD&D growth prospects for years into the foreseeable future, which may not sit well with investors that have seen this stock double since 2009 and are probably looking for robust growth in order to push its share price higher. It's hard to argue that Johnson & Johnson's pharmaceutical division could in any way be called a weakness for the stock given its 21% year-over-year growth in the latest quarter. However, the recent approval and pricing of Gilead Sciences (NASDAQ:GILD) hepatitis C drug Sovaldi could change all that. Sovaldi is a game-changing drug, without question. Its sustained virologic response, or the point at which researchers can no longer find detectable levels of hepatitis C in a patient after a 12-week treatment course, are significantly higher than prior-generation hepatitis C treatments. More importantly, it can be given to select genotypes without the need for interferon, a therapy known to have unpleasant flu-like side effects. But, Sovaldi's price tag of $1,000/day, or $84,000 per treatment course, left Congress and insurers dumbfounded. By comparison, Johnson & Johnson's hepatitis C treatment Olysio costs a bit less; but at $66,000 a year is still enough to price a number of consumers out of the market and cause insurers a bad case of indigestion. Similarly, Imbruvica, the company's chronic lymphocytic leukemia and mantle cell lymphoma drug that was co-developed with Pharmacyclics, will set patients back $98,400 per year. To be clear, J&J isn't the sole price offender when it comes to high-priced pharmaceuticals in the U.S. There are a lot of factors, actually, which contribute to high drug prices in this country, and J&J is merely following in the footsteps of many of its peers when it comes to pricing. Source: Ano Lobb via Flickr. It's possible, however, that Congress or insurers may hold firm on their drug pricing stance one of these days, which would be a major blow to the pharmaceutical industry, and could represent a big problem for patients. We've already witnessed pharmacy-benefits manager Express Scripts' (NASDAQ:ESRX) announcement in November that it'd be dropping more than three-dozen drugs and medical devices from its network this year because of high pricing. Interestingly enough, some of these excluded newly approved drugs. Long story short, if Congress, PBM's or the insurers themselves step back away from covering high-priced drugs it could be a bad day for J&J and other large pharmaceutical stocks. Finally, Johnson & Johnson investors should still be concerned about the impending loss of patent exclusivity on arthritis drug Remicade, which is on pace to bring in just shy of $7 billion in annual sales in 2014, or about 23% of total pharmaceutical sales. Johnson & Johnson Q2 presentation slide. Source: Johnson & Johnson. According to Bloomberg, Remicade's European patents are protected through Feb. 2015, while in the U.S. those patents extend until Sept. 2018. To provide some context to these figures, U.S. Remicade sales comprised 59% of its $3.41 billion in sales during the first-half of 2014. This would mean a decent chunk of the remaining 41% of its revenue stream from Remicade could find itself under pressure in just six months! Last summer, both Hospira and Celltrion won EU-backing for biosimilars to Remicade, so both are simply biding their time and waiting to pounce. The good news here is that secondary patents do exist on the drug, which may open the door for patent litigation lawsuits that could stave off the introduction of generics, at least for some time. The downside here is that five years from now its Remicade sales are likely to fall from a peak that could potentially top $8 billion prior to the introduction of generic competition to probably less than $2 billion, by my best estimate, all within a year. 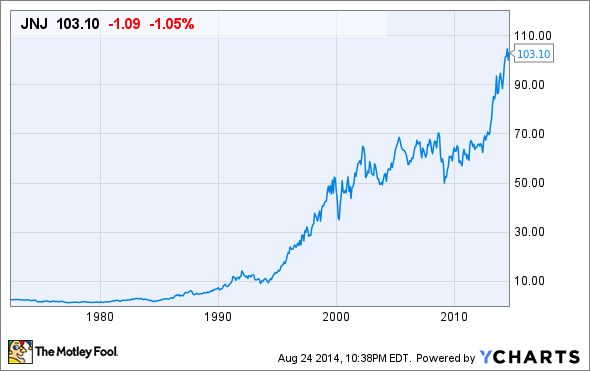 That patent cliff shock could limit J&J's upside and possibly even push the stock lower. Johnson & Johnson is a dividend aristocrat and a blue-chip bellwether that's generally a staple in retirement portfolios. But, as you can see from the above points, it's not without its shortcomings. These factors have a very real chance to slow J&J's long-term growth and weigh on its share price. Regardless of whether you own J&J right now or you've considered buying into this stock, it's important that investors consider both sides of this coin.